Wolfgang Beltracchi, is considered one of the most audacious forgers of recent decades. In 2011, he was found guilty by a German court of forgery and corruption relating to 14 fakes that had sold for a total of $45m, sending shockwaves through the art world. Beltracchi has since claimed to have forged around 300 works by artists including Max Ernst, Max Pechstein, André Derain and Fernand Léger. 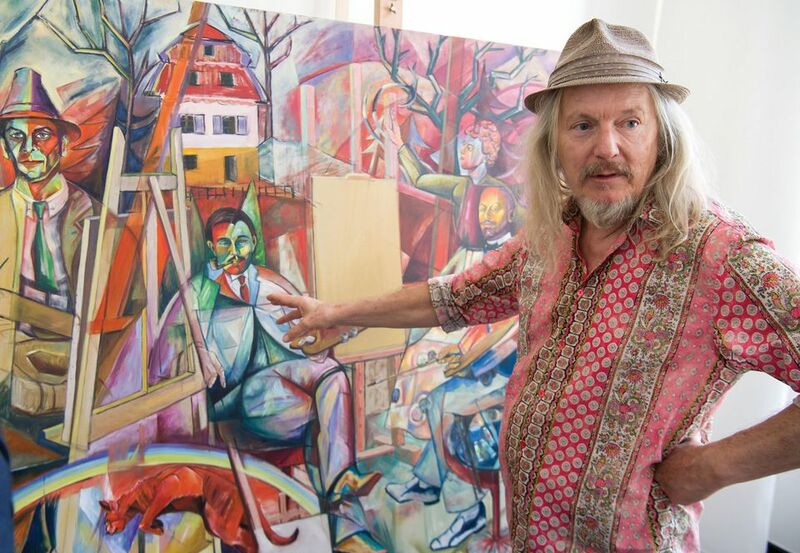 Beltracchi was released from prison in January 2015 and now he is painting again—under his own name. His recent works, alongside photographs by Mauro Fiorese, was included in an exhibition titled Kairos: The Decisive Moment, at the Biblioteca Nazionale Marciana in Venice. The exhibition, financed by the collector and gallery owner Christian Zott, travels to Barlach Halle K in Hamburg (20 November to 19 December) then to the Bank Austria Kunstforum Wien in Vienna (3-22 September 2019). Beltracchi’s works in the exhibition are priced at between €250,000 and €300,000—somewhat less than the millions paid for some of his fakes. In Venice, Beltracchi spoke to The Art Newspaper about ethics, the art market and how to be a good forger. The Art Newspaper: Considering your past, who buys your paintings? Wolfgang Beltracchi: As a rule, my paintings are already sold before they are finished. I do not have a market in the strict sense because the big auction houses want to keep away from me, even if I’ve had good business relations with them for 20 to 30 years. Obviously, they did not know that the paintings were fake. I’m not one that really supports this art market—it has mafia structures. But the reality is that my paintings are hanging next to Richter or Warhol or who knows who. If I think of people like Baselitz, who has hung his paintings upside down for 50 years and is also a mediocre painter, which he admits—he has always wanted to become a painter but he did not have the necessary talent. And what about Jeff Koons? But those [artists] are factories and you must always use quotes when you say “great” artists. And yours was a factory, of fakes. No, it was not a factory, because I painted individual paintings and I never replicated them, they were always unique pieces from a certain context, a certain period, with a certain technique, with a certain narrative. These artists—Jeff Koons, but also Ai Wewei, and there are many more—are promoted by great dealer and everyone earns a lot of money. It is trade, but it has no originality. However, in my opinion, the bad thing is that people—the man on the street—are made to believe that those works are rare, unique, and of course it’s not true at all. People are deceived, swindled, and invest their money in a very vague matter. But you have benefited from that system for 40 years. That’s right, I’ve made a profit, but I do not want to be part of that game anymore, under any circumstances. Your paintings now bear your name, but your working method seems to have remained the same? Yes, but now I no longer have to respect the temporal boundaries. If I make a fake dated 1914, it is imperative to respect that time boundary; I must ignore everything that happened after. It is perhaps the most difficult aspect of the whole procedure. After studying a painter, I know what he had eaten, I smell his food. It is like Free Method Acting, in fact I call it Free Method Painting. Besides a total immersion, what are the qualities of a good forger? He [must be] an art historian who is a restorer, who is a painter and who has scientific knowledge. My father was a church painter and from the age of 12 I went to church with him after school. Together we restored paintings and frescoes. At 17, I could paint anything. I also studied anatomical drawing and sculpture. But a little titanium white paint that you used for Red Picture with Horses “by Heinrich Campendonk” was your downfall. That day I did not have a white zinc and I took a white already made, in which there was a little titanium, but it was not indicated on the label. But the truth is that I am one of the greatest forgers that ever existed, and I am part of the history of art. I am hanging incognito in many museums. For example, there are many of my works in Japan, because at the end of the 1980s the Japanese bought a lot in Paris and London, and they have obviously also bought my paintings. I also have at least a hundred volumes in which my paintings are published. Are there still people who bought your paintings who do not know? I only sold to around a dozen big dealers and auction houses, I did not sell to individuals. We informed our buyers and they could inform their customers. We told them that they could give us back the paintings. Naturally, we have not indicated every single painting. We said: “Everything you bought from us was false.” Well, they did not react at all. We have not even received a [single] painting back.